Shane Shirley : Update on BPA and Little Beards in Maine...It's BIG News and It's Thanks to You! Update on BPA and Little Beards in Maine...It's BIG News and It's Thanks to You! The EWG did find a possible explanation for Governor LePage's opposition to the bill to ban BPA: one of his former aides now represents the toy industry and drafted a list of laws and regulations the governor should consider axing - including the ban on BPA. So maybe Governor LePage had his hormones a little mixed up and his loyalties a little skewed, but his misinformation didn't keep Maine from becoming the ninth state to ban the use of bisphenol A (BPA) in baby products! Great job you guys!! Along with you and me, there were 19,000 supporters who responded by helping to send the real science to the Governor. 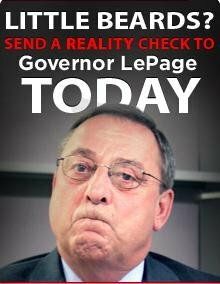 And get this, with the help of an enthusiastic supporter and her eight-year-old son, the EWG delivered the latest BPA science and your petition signatures to Governor LePage. Then the Maine House of Representatives went to work to protect their youngest constituents and passed the ban with a veto-proof majority. Not to be outdone, the state Senate passed the ban unanimously. These sweeping victories are thanks to the overwhelming public outcry in reaction to Governor LePage's misguided understanding and comments on BPA. Thank you for joining EWG Action Fund in standing up for science. While the fight is not done, there are still 41 states that do not ban BPA in baby products, the victory in Maine is an important step forward! Pat yourselves on the back and stay tuned to EB for more calls to action that you can answer.